MEDIPACK Automatic Servo Base Filling Machine, works on Rotation of Servo & Gear Pump base principle with diving nozzles. The Process of Filling system by complete servo mechanism, Liquid flow from STORAGE TANK By Syringe and the Syringe pump push to Liquid In Filling Nozzle and Control by Servo Motor. The unit is made compact, versatile and enclosed in stainless steel elegantly matt finish body, consists of S.S. Slat Conveyor, Reciprocating Nozzle with self-centering devices & SS Syringe. No container No filling system arrangement is standard features of the machine. We are a noteworthy organization in the domain, engaged in offering an excellent range of Automatic Tomato Sauce Bottle Filling Machines which are high precision filler meant dispense ketchup into bottles. 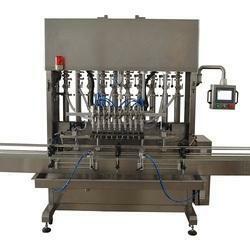 This machine is available in various specifications and is capable of packing various sizes of sauces bottles. Due to its hassle free operation and optimum efficiency, this machine is widely demanded in the market. We are instrumental in providing our clients with a comprehensive range of Tomato Sauce Filling Machine. 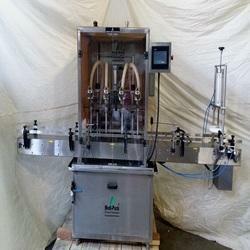 Offered machine is easy to operate and smooth setting for filling volume. Our machines are used for filling of syrups, edible oil, detergent, paints, lubricants and more. The filling speed of these machines can vary due to the viscosity and the filling character of the product to be filled.